The pet was owned illegally and has been transferred to a conservation area. AN INDONESIAN WOMAN has been mauled to death by a huge pet crocodile on the island of Sulawesi, officials said yesterday. Deasy Tuwo, the head of a laboratory at a pearl farm in Minahasa in North Sulawesi, was killed by the 4.4-metre reptile last Thursday, authorities said. The giant reptile was sedated and removed from its enclosure on Monday in a three-hour operation that involved dozens of people, including conservation officials, the army and police. 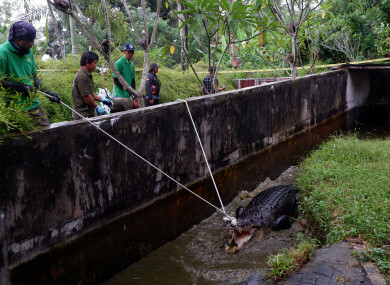 Email “Woman mauled to death by pet crocodile in Indonesia”. Feedback on “Woman mauled to death by pet crocodile in Indonesia”.